The Cockerel pub suffered "extensive damage"
Ninety-three West Ham fans have been arrested after violence before and after a London derby football match. Police arrested the fans before the Hammers' Carling Cup clash against Tottenham Hotspur at White Hart Lane, north London, on Wednesday. 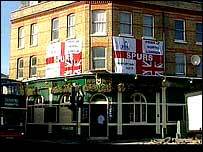 They were called at 1508 GMT to a Tottenham supporters' pub, The Cockerel, on Tottenham High Road, after reports of a large group causing trouble. 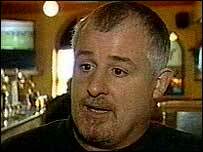 The pub suffered "extensive damage" and a number of West Ham fans were later arrested at nearby Northumberland Park for criminal damage and violent disorder. Police said "skirmishes" continued throughout the afternoon and evening on the High Road and at least two other pubs were damaged. There were some injuries and one man, who is not thought to be seriously hurt, was taken to hospital. Scotland Yard said there was no trouble inside White Hart Lane, although two people were arrested and eight ejected for drinking and vandalism offences during the game which started at 1945 GMT. Police are now examining CCTV footage to "find any other perpetrators". Gary Lee, the owner of the Cockerel, told BBC London: "I'm surprised at the police. They are usually on the ball but I think they were caught on the hop. "At one point there were just two WPCs in the middle of it all and I felt sorry for them. "But I don't understand how 150 football fans can go from one side of the London to the other without being noticed." Premiership side Tottenham beat their Division One rivals 1-0 after extra time to go through to the fourth round of the Carling Cup. "It was not a good advert for a London derby"